This series of Blue Planet has enabled us to see so much of the ocean that we are normally unaware of; we’ve been able to truly appreciate the magnificence of the seas all the way from the deepest trenches to the rocky coasts. But for many, with this appreciation has come the realisation of the devastating impact of human activity on our planet’s marine life. Marine researchers at Newcastle University have been working to assess the extent of human impact on the ocean, looking at everything from chemical and plastic pollution to CO2 levels and increasing sea temperatures. A research team led by Newcastle University’s Dr Alan Jamieson, used deep sea landers to reach the bottom of the Pacific Ocean’s Mariana and Kermadec trenches, to bring up samples of the organisms that live there. The fatty tissue of the amphipods they sampled contained extremely high levels of Persistent Organic Pollutants – or POPs – including polychlorinated biphenyls (PCBs), which were banned in the 1970’s. Such pollutants are invulnerable to environmental degradation and will remain in the environment for decades. Dr Jamieson believes these pollutants will have found their way to the depths of the trenches through contaminated debris and dead animals sinking to the bottom of the ocean, which then work their way up through the food chain. Sending the deep sea landers down to the ocean floor. Following on from this study which revealed shocking levels of chemicals in the deep, Dr Jamieson began to investigate whether plastics had also polluted to the same extent. Using the deep sea landers to bring samples to the surface, the research team examined 90 individual animals and found ingestion of plastic ranged from 50% in the New Hebrides Trench to 100% at the bottom of the Mariana Trench. Dr Jamieson explained that this type of work requires a great deal of contamination control, but that the results were undeniable, with instances where synthetic fibres could actually be seen in the stomach contents of the specimen as they were being removed. “The fact that we found such extraordinary levels of these pollutants in one of the most remote and inaccessible habitats on earth really brings home the long term, devastating impact that mankind is having on the planet,” says Dr Jamieson. Pollutants such as plastic and chemicals are not the only issues our seas face; the oceans also absorb a large amount of heat and CO2 from human emissions. Of the emissions absorbed by the global ocean, the Southern Ocean takes a staggering 75% of the heat and 50% of the CO2. A team from Newcastle University, comprised of Dr Miguel Morales Maqueda, Alethea Mountford and Liam Rogerson, are in the Antarctic as part of the ORCHESTRA research project (Ocean Regulation of Climate by Heat and Carbon Sequestration and Transports). Explaining the involvement in the project, Dr Maqueda said: “We have been invited to participate in ORCHESTRA on account of our expertise in the use of surface robotic systems to carry out sea surface measurements. The aim is to use these oceanography surveys to gain a better understanding of the mechanisms that lead to the transfer of heat and greenhouse gases from the atmosphere into the ocean and how they are subsequently distributed globally. 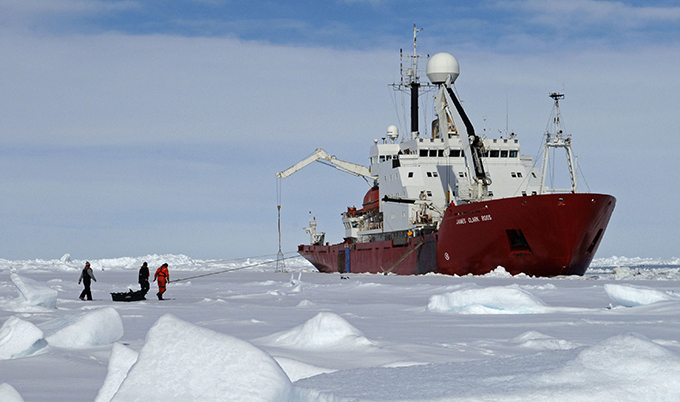 Research vessel RRS James Clark Ross, where the team will be based. Humans are undoubtedly having an increasingly negative impact on the ocean. When faced with this fact it becomes all too easy to lose hope, but pioneering research such as that from Newcastle University works to highlight the serious issues at hand and as such people are becoming more aware of how everyday actions can have wider consequences for the environment. We need only take a look at the solutions that Newcastle researchers have developed for the disastrous episodes of coral bleaching around the globe to illustrate that advancements in ideas and technology are being made all the time to work to reduce and reverse negative human impact. If you feel inspired to make a difference to the marine world, take a look at the courses offered at Newcastle University in Marine Science and Marine Technology.